Provide a communication channel with local or remote NDN forwarder. Definition at line 93 of file face.hpp. transport the transport for lower layer communication. If nullptr, a default transport will be used. The default transport is determined from a FaceUri in NDN_CLIENT_TRANSPORT environ, a FaceUri in configuration file 'transport' key, or UnixTransport. 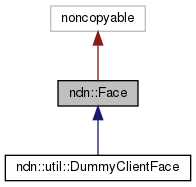 Definition at line 70 of file face.cpp. Create Face using default transport and given io_service. ioService A reference to boost::io_service object that should control all IO operations. Definition at line 64 of file face.cpp. Create Face using given transport and KeyChain. transport the transport for lower layer communication. If nullptr, a default transport will be used. Definition at line 76 of file face.cpp. A handle for canceling the pending Interest. Definition at line 131 of file face.cpp. Referenced by ndn::security::v2::CertificateFetcherDirectFetch::doFetch(), and ndn::security::v2::CertificateFetcherFromNetwork::doFetch(). pendingInterestId a handle returned by expressInterest. Definition at line 147 of file face.cpp. Referenced by ndn::PendingInterestHandle::PendingInterestHandle(), ndn::util::NotificationSubscriberBase::stop(), and ndn::util::SegmentFetcher::stop(). Cancel all previously expressed Interests. Definition at line 155 of file face.cpp. Get number of pending Interests. Definition at line 163 of file face.cpp. Set InterestFilter to dispatch incoming matching interest to onInterest callback and register the filtered prefix with the connected NDN forwarder. This version of setInterestFilter combines setInterestFilter and registerPrefix operations and is intended to be used when only one filter for the same prefix needed to be set. When multiple names sharing the same prefix should be dispatched to different callbacks, use one registerPrefix call, followed (in onSuccess callback) by a series of setInterestFilter calls. signingInfo (optional) Signing parameters. When omitted, a default parameters used in the signature will be used. A handle for unregistering the prefix. Definition at line 185 of file face.cpp. Definition at line 195 of file face.cpp. Set InterestFilter to dispatch incoming matching interest to onInterest callback. This method modifies library's FIB only, and does not register the prefix with the forwarder. It will always succeed. To register prefix with the forwarder, use registerPrefix, or use the setInterestFilter overload taking two callbacks. A handle for unsetting the Interest filter. Definition at line 213 of file face.cpp. Register prefix with the connected NDN forwarder. This method only modifies forwarder's RIB and does not associate any onInterest callbacks. Use setInterestFilter method to dispatch incoming Interests to the right callbacks. Definition at line 227 of file face.cpp. Remove the registered prefix entry with the registeredPrefixId. This does not affect another registered prefix with a different registeredPrefixId, even it if has the same prefix name. If there is no entry with the registeredPrefixId, do nothing. Definition at line 241 of file face.cpp. Remove previously set InterestFilter from library's FIB. This method always succeeds and will NOT send any request to the connected forwarder. interestFilterId a handle returned by setInterestFilter. Definition at line 249 of file face.cpp. If registeredPrefixId was obtained using setInterestFilter, the corresponding InterestFilter will be unset too. Definition at line 257 of file face.cpp. Referenced by ndn::RegisteredPrefixHandle::RegisteredPrefixHandle(), and ndn::RegisteredPrefixHandle::unregister(). This method can be called to satisfy incoming Interests, or to add Data packet into the cache of the local NDN forwarder if forwarder is configured to accept unsolicited Data. Definition at line 169 of file face.cpp. Referenced by ndn::util::NotificationStream< Notification >::postNotification(). Definition at line 177 of file face.cpp. Process any data to receive or call timeout callbacks. This call will block forever (default timeout == 0) to process IO on the face. To exit cleanly on a producer, unset any Interest filters with unsetInterestFilter() and wait for processEvents() to return. To exit after an error, one can call shutdown(). In consumer applications, processEvents() will return when all expressed Interests have been satisfied, Nacked, or timed out. To terminate earlier, a consumer application should call removePendingInterests() for all previously expressed and still-pending Interests. If a positive timeout is specified, then processEvents() will exit after this timeout, provided it is not stopped earlier with shutdown() or when all active events finish. processEvents() can be called repeatedly, if desired. If a negative timeout is specified, then processEvents will not block and will process only pending events. keepThread Keep thread in a blocked state (in event processing), even when there are no outstanding events (e.g., no Interest/Data is expected). If timeout is zero and this parameter is true, the only way to stop processEvents() is to call shutdown(). This may throw an exception for reading data or in the callback for processing the data. If you call this from an main event loop, you may want to catch and log/disregard all exceptions. Definition at line 414 of file face.hpp. This method cancels all pending operations and closes connection to NDN Forwarder. Note that this method does not stop the io_service if it is shared between multiple Faces or with other IO objects (e.g., Scheduler). Calling this method could cause outgoing packets to be lost. Producers that shut down immediately after sending a Data packet should instead use unsetInterestFilter() to shut down cleanly. Definition at line 272 of file face.cpp. Definition at line 439 of file face.hpp. Definition at line 267 of file face.cpp. Definition at line 450 of file face.hpp.